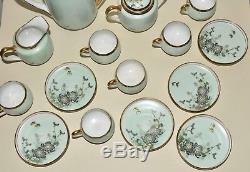 Antique Japanese porcelain tea set. 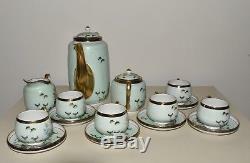 This is such a sweet set in very fine porcelain. 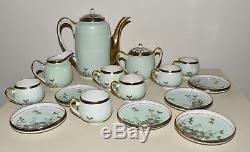 Mint green with delicate florals and butterflies in black, green, blue and yellow with gold gilt accents. A hint of red on the butterflies. The borders are black with gilt geometric design. All pieces are marked on the bottom in gold inside a red rectangle. 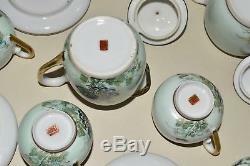 Set includes: Teapot with lid. Sugar bowl with 2 handles and lid- 3 3/4" tall to top of finial x 5" wide handle to handle. 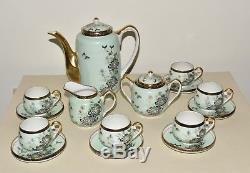 Creamer with handle- 3 1/8" tall to top of spout x 4" wide spout to handle. 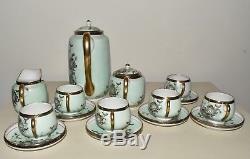 6 Demitasse cups- 1 7/8" tall x 2" round at opening. 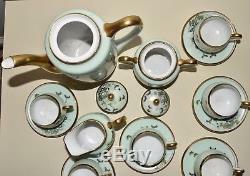 6 demi saucers- 3 3/4 round. I looked carefully at each piece under a lighted magnifying lamp. A little wear to the gold but not much. 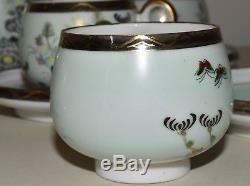 No cracks or chips or repairs except for one cup which has a crack down the side, see last photo close up. Please roll over all 12 photos for close up and details as this is also part of the description. Most everything I sell is vintage. I do my best to accurately describe what I see. Thank you and good luck! 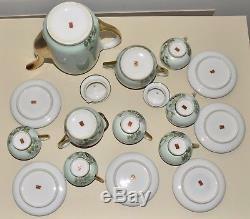 The item "Antique Vtg Japanese Satsuma Tea Pot Set Demitasse Cups Saucers Cream Sugar" is in sale since Friday, October 13, 2017. 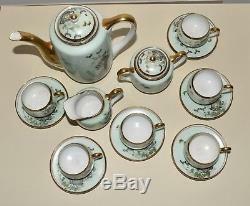 This item is in the category "Antiques\Decorative Arts\Ceramics & Porcelain\Teapots & Tea Sets". 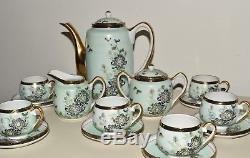 The seller is "erdesigns03" and is located in Marlton, New Jersey.